My first bit of exciting news.......I STARTED BACK AT CROSSFIT! It's been a solid 11 months since I had shoulder surgery to repair a torn labrum (which I did NOT injure while working out, mind you). I knew I missed CrossFit but I didn't realize how much until my first day back! It kind of felt like a first day of school when I was walking in but it felt SO GOOD to be back; I was grinning ear to ear the whole time. I am still teaching at Beyond Studios, and I enjoy taking Pilates and 500 there, as well, but I've really missed olympic lifting and am happy to have to have a shoulder that [mostly] works again! I also have started working with Fabletics shooting photos for their website! So, basically fitness modeling! On one hand I love that they are using REAL models and on the other hand I wish I was in a bit better shape hahaha. Luckily Crossfit should help with that! The photo above is from one of my latest shoots. I considered doing a Fabletics review blog post....if you'd be interested in that, let me know! Important update for the state of Oklahoma......we can now BUY WINE IN GROCERY STORES. Praise hands! 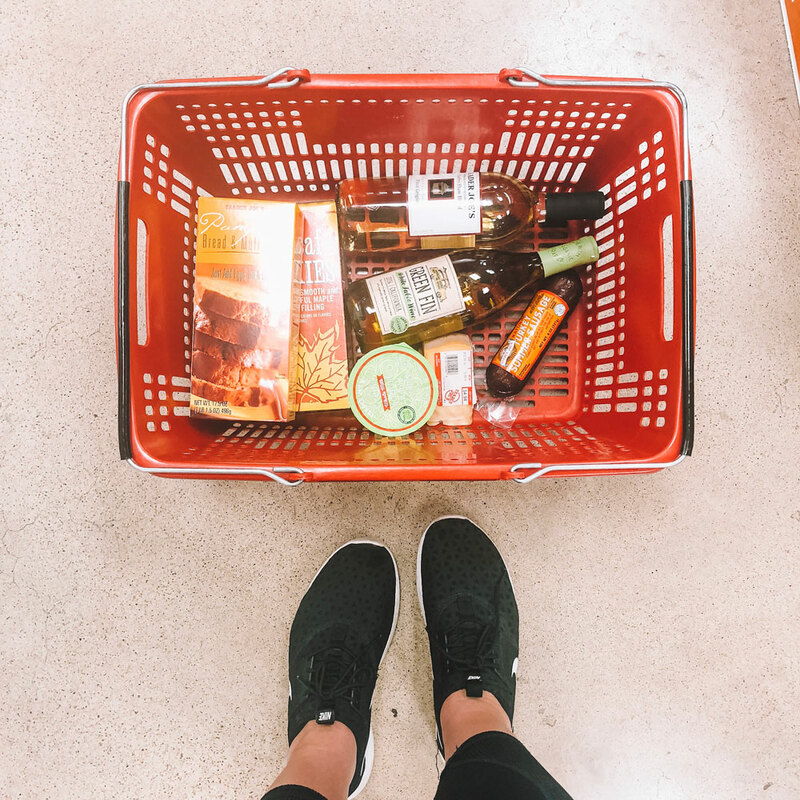 Up until October of 2018, we had to buy wine and craft beer (anything over 3.2 beer) at liquor stores and it could not be chilled. It was a pain. But now, grocery stores can sell 6 point beer and wine! You better believe Trader Joe's was a mad house......and still kind of is. Did you know that it's required for those who work at financial institutions to take a full week off of work each year? They assume that if you're secretly taking money out of any accounts that they would be able to catch it during your week off. 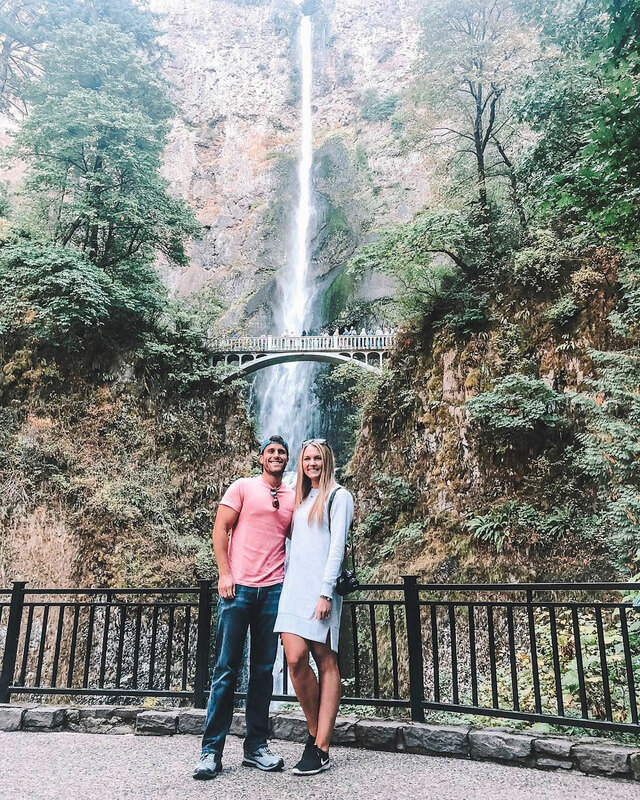 C and I both work for financial institutions so we use this as an excuse to go on a longer trip than our usual weekend getaways. This year we went to Oregon to visit my Aunt, Uncle and cousins! It is such a gorgeous state to visit, no matter what part you're in, and it is always fun to catch up with family. I would move to Oregon in a heartbeat! You can see everything we did in this blog post. 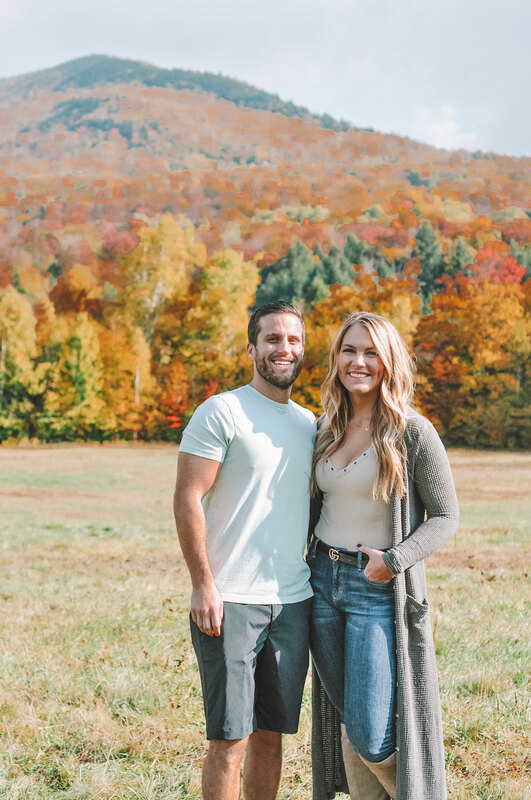 We were home from Oregon for about a week before jetting off to Vermont to do all the fall things! My mom grew up in Vermont so it was kind of special to see her hometown and a lot of our family history. I LOVED Vermont, it was like a playground for basic white girls! It was seriously SO beautiful, it made me legit question why I live in Oklahoma haha. I love OKC with all my heart but it is definitely not the prettiest landscape in the US of A, let's be real! You can read my Vermont post here. We only have one more trip left for 2018, I am sad our year of travel is coming to an end but I can't wait to go on a little Christmas trip in December! 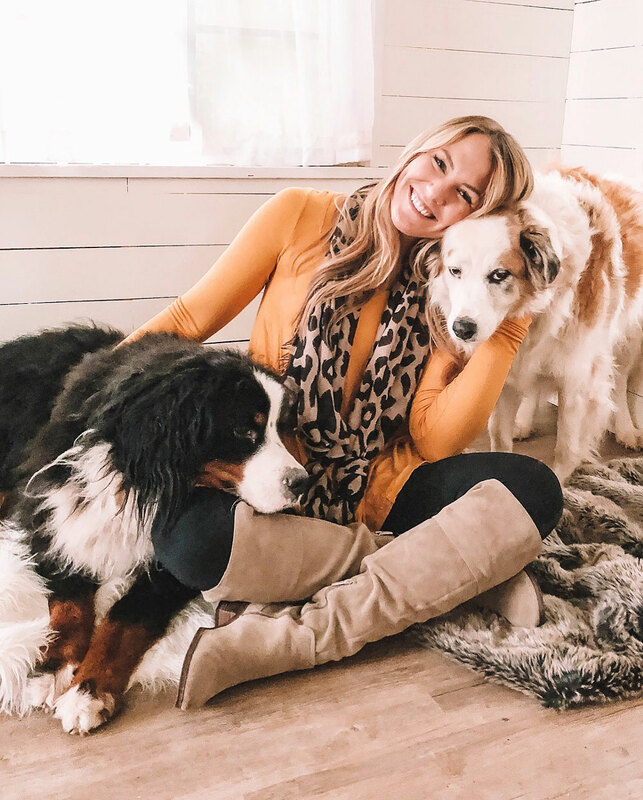 HEADS UP - the outfit I'm wearing above is from Greige Goods, my favorite boutique in Stillwater! 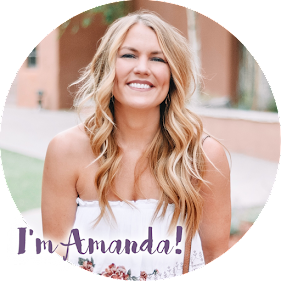 They are currently doing a 25% off sale on their website with code AMANDA25! There is also a $100 gift card giveaway going on on my Instagram! The gift card works online and in store so even if you aren't local you can still use it. Go enter and good luck! 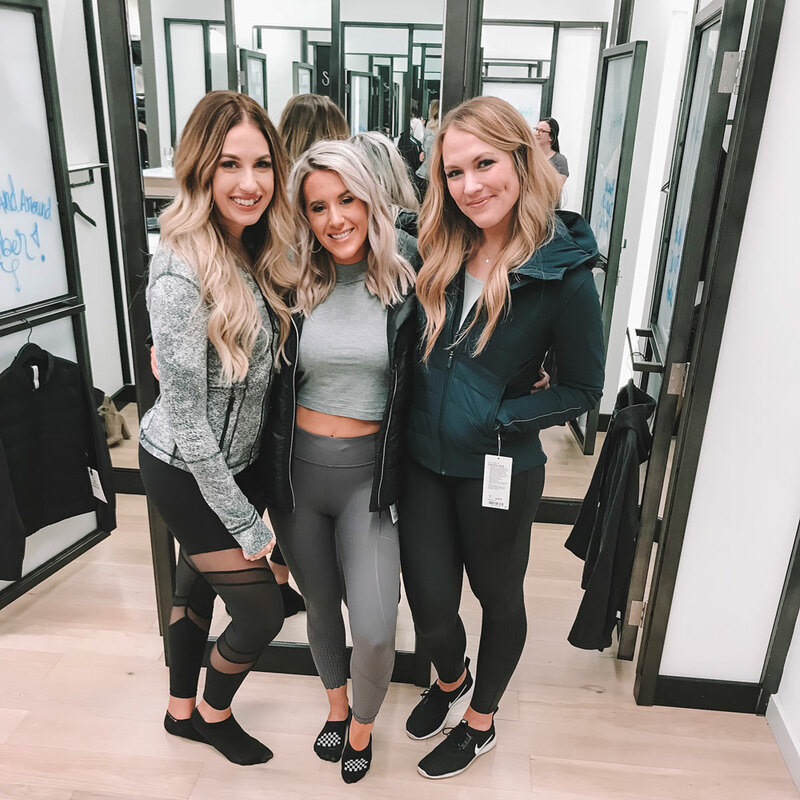 The night we got back from Vermont I hopped off the airplane and ran straight to Lululemon OKC for a little party with these babes! 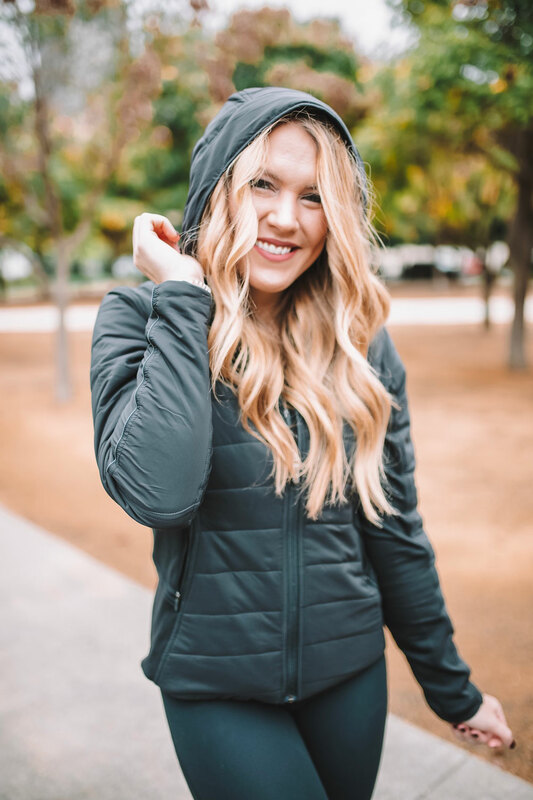 Lulu was showcasing their new outerwear line and ya'll....it did not disappoint! No lie I've been wearing the jacket I got on a daily basis. I love that they've added a lot of casual apparel (like bomber jackets and jumpsuits) to their line. Love me some Lulu. Of course, since it's football season we've been in Stillwater a lot! It's always fun to go to games but it's especially fun when you get to sit in the cutest suite in the whole stadium! 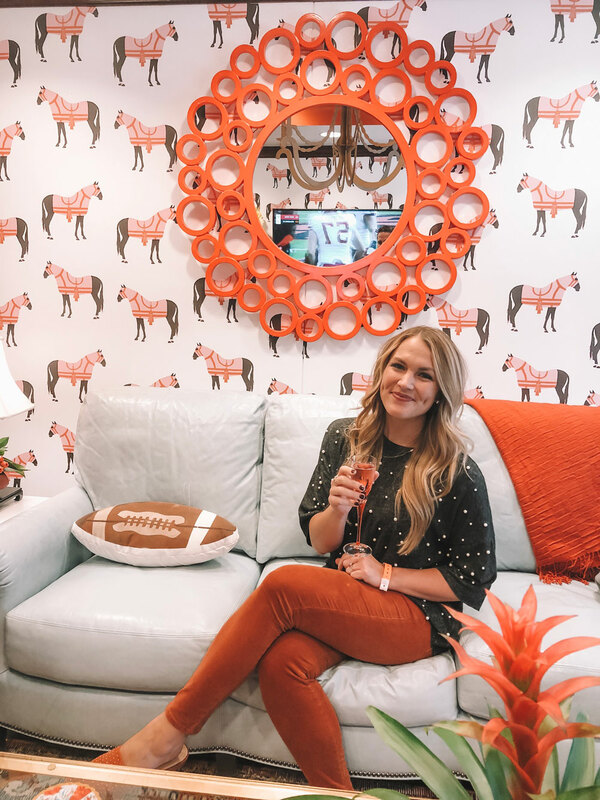 Garden Party Florist hosted us for the last home game in the suite they decorated and it had me wanting to redecorate a room at home! That wallpaper, swoooooon!! Unfortunately the Pokes lost (again) but I didn't care, I had enough chocolate and wine to take the pain away. On the way to said football game, C got a blowout in his car while the dogs were in the car with us. 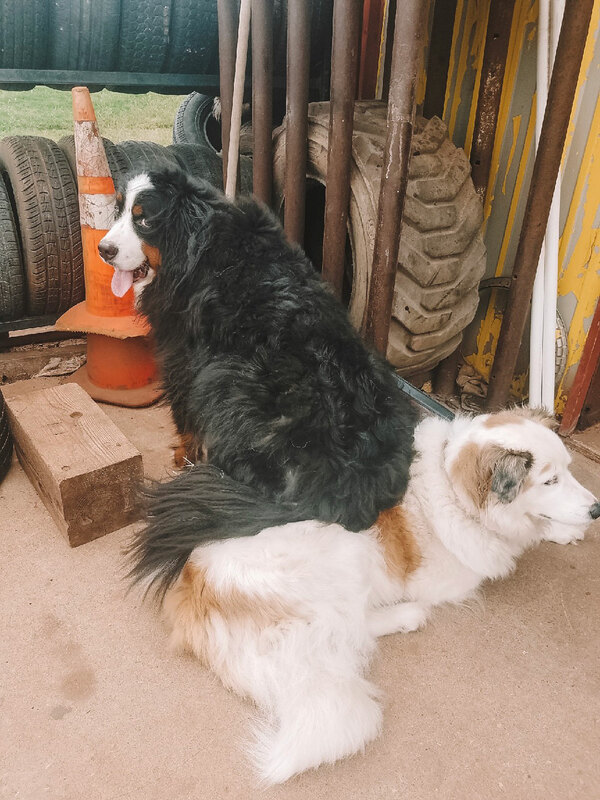 They got to be shop dogs for a little bit while we had the tire replaced! I can't with this photo. Thank God for AAA. 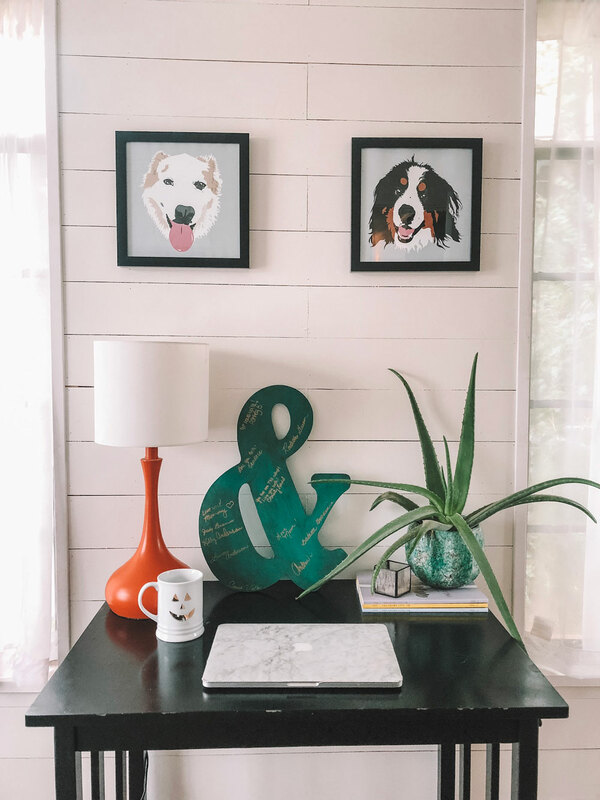 Can we talk about how cute these puppy posters are?!! Pink Sunshine Vibes reached out to me and asked if she could do some prints of Chloe and Kylo. How could I say no?! They are absolute perfection and look so cute hanging in our sunroom slash Kylo's bedroom. I love how she even captured Kylo's tangled ears (it is impossible to keep them fluffy and brushed, believe me we try) and Chloe's big smile! Chloe's smile clearly does not always stick around........she is not a fan of photoshoots (just check the photo below LOL). I think these would make such great personalized Christmas gifts for any dog lovers in your life. They also have phone cases, coffee mugs and other fun items! Shop my outfit here. Tee and boots are both on major sale! I just had to share this picture because of Chloe's face. My GOODNESS. So dramatic! Alright, last but not least! Sorry for all the dog photos haha. 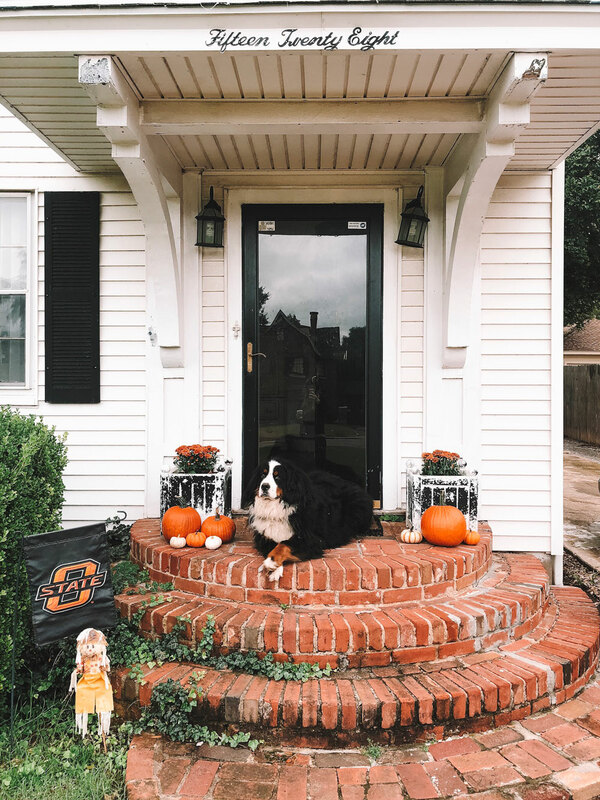 Kylo helped me get our fall front porch put together! I've only killed one round of mums so far......fingers crossed this second set will last through the rest of October at least! I got my pumpkins at Trader Joe's - they were like $1.99 I think? Such a steal! Can't wait to carve them. Do you have any fun Halloween plans or weekend plans? I have a cute little couples costume in the works that I can't wait to share. My work is doing a department costume contest so I get to wear TWO costumes this year! I love to go all out for Halloween and am so excited. This weekend I am planning on spending as much time on the couch as possible....I need some serious R+R! Whatever is on your agenda, have an amazing weekend!